A 12-story United Launch Alliance Delta 2 rocket powered the 4,500-pound spacecraft to orbit from Cape Canaveral, thundering off its seaside pad 17A exactly on schedule at 8:23 a.m. EDT (1223 GMT). "The 45th Space Wing and its mission partners have again accomplished another major milestone in our national quest to improve and maintain our space capabilities," said Col. Stephen Butler, 45th Space Wing vice commander at the Cape. "The GPS constellation has worldwide significance and all of the satellites are launched from right here at the world's premier gateway to space." Weather forecasters had worried about thick clouds and rainshowers spoiling the launch opportunity, but skies above the launch pad remained spectacularly clear for the Delta to fly away on more than 700,000 pounds of roaring thrust. After traveling about 11 minutes eastward over the Atlantic Ocean, the rocket achieved orbital velocity and settled into an initial orbit. It coasted in a slow, quiet rolling motion for about 50 minutes, reaching the western Pacific Ocean in view of the Guam tracking station when the second stage engine fired briefly to nudge the altitude higher, then released the solid-fuel third stage to propel the satellite into the planned orbit. 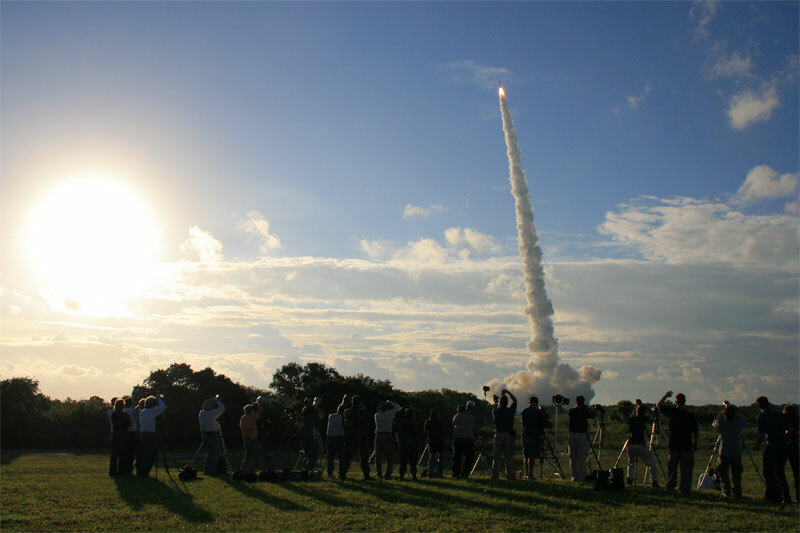 A telemetry relay snag prevented engineers at the Cape from seeing the third stage action as well as deployment of the payload in real-time. Officials waited several minutes until satellite ground controllers made contact with the newly-launched spacecraft to confirm the Delta's ascent had been a complete success, marking the 77th in a row for the workhorse booster. "My hat is off to this GPS and Delta 2 launch team, they're a talented group of professionals who carried out today's countdown and this entire campaign with great enthusiasm, diligence and a sharp focus on mission success," said Col. James Planeaux, the Air Force mission director and commander of the Delta Group. The $75 million satellite, officially known as GPS 2R-17, is the fourth in an ongoing series of eight with improvements designed to better the GPS network. The modernized satellites transmit additional signals and feature improvements aimed at greater accuracy, tougher resistance to interference and enhanced performance for users around the world. If all goes well, a kick motor on the GPS 2R-17 satellite will fire late Friday to circularize its orbit at 11,000 miles for the trip to join the GPS constellation. The craft is headed for the Plane F, Slot 2 position of the constellation to replace the aging GPS 2A-14 satellite, which was launched in July 1992 with a seven-year design life. The old satellite will be drifted eastward of its current position and put into a backup role, Air Force officials said. The orbiting network currently has 30 operational satellites, which emit continuous navigation signals that allow users to find their position in latitude, longitude and altitude and determine time. "The improved signals provided by the GPS satellites will continue to provide around the Earth precise positioning, navigation and timing service any time, any place, right time and right place supporting both the warfighter and the growing needs of our global economy," said Col. David Madden, commander of the Global Positioning Systems Wing. To keep navigation information flowing from GPS and the orbiting system in good health, the Air Force launches replacement satellites as they are needed. The constellation is divided into six orbital groupings, called planes, with at least four satellites in each. Wednesday's liftoff was the first new GPS satellite launched in almost a year, but it was the 17th dating back to 1997 for the Lockheed Martin-built Block 2R spacecraft program created to replenish the space infrastructure and replace original satellites as they age. 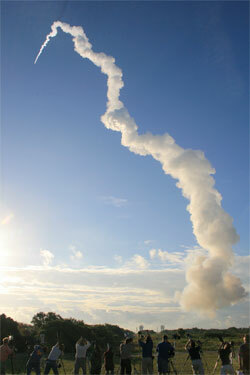 "GPS is not only a military asset, but a national asset due to its civil applications," said Capt. Bill Bakker, GPS 2R field program manager with the 45th Launch Support Squadron at Cape Canaveral. "This mission is vital to the sustainment of our GPS constellation. Our team takes a great deal of satisfaction and pride in replenishing a constellation that is so critical to our warfighters." Four more satellites of this current Block 2R generation, each having been upgraded with the new modernized features, are left to launch. Those flights aboard Delta 2 rockets are targeted to occur over the next 11 months -- in December, March, June and September. "We're looking forward to an exciting year ahead where we'll process and launch four more GPS Delta 2 missions," Col. Planeaux said. 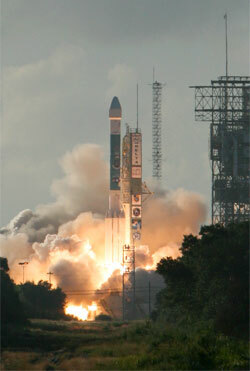 A new era of satellites with even more advancements, called the GPS 2F series and built by Boeing, is scheduled to debut in January 2009, Air Force officials said. Those craft will fly aboard Atlas 5 and Delta 4 rockets.